Jews first came to Laurel, Mississippi in the 1890s, not long after the town was founded in Mississippi’s pine belt. It became a regional center for the timber industry, as the railroad brought it into the national market.By the turn of the century, Laurel milled and shipped more yellow pine wood than any other town in America. Laurel’s economic emergence led to the arrival of Jewish settlers, who opened stores catering to the town’s timber workers and their families. By 1900, there were nine Jews in Laurel, the nucleus of a small, but vibrant community to come. The town soon formed a congregation and built a synagogue in 1907. The Jewish community remained until well into the 20th century. Jewish business owners found opportunity in Laurel. One prominent Jewish family in Laurel was the Fine family. They owned the Fine Brothers Store, which sold shoes, cloth, and other general goods for both men and women at highly reduced prices. 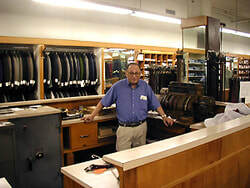 The store was founded by Nathan, Louis, and Joe Fine, though later, Harry Fine joined the business. Despite the name “Fine Brothers” Harry was of no relation to the other three. He had grown up in the New Orleans Jewish Children’s home and later joined them as a business partner. The Fine Brothers Store eventually merged with another Jewish business, run by Dave Matison, and became Fine Bros.-Matison. 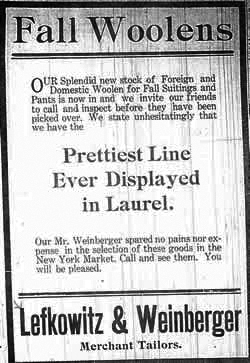 Other Jewish stores included Lefkowitz & Weinberger, who advertised that their fall suits were the “prettiest line ever displayed in Laurel.” This store was built by Nathan Weinberger and Pincus Lefkowitz, who had come to Laurel from Meridian. They were not only master tailors, but also socially popular. Weinberger was known for administering dance lessons to the young socialites of Laurel. Though their numbers were always small—a 1937 survey found 65 Jews living in Laurel—Jews were a visible part of the community. Each year, on the high holidays, Jewish merchants would run ads explaining that they would be closed for business that day. In 1907, the first time the new Jewish congregation observed the high holidays, the Laurel Chronicle ran an article describing the religious significance of the holiday, and stating that due to religious observance, all of the Jewish owned stores would be closed. In addition the synagogue built in 1907, Jews also formed other organizations, including a local chapter of B’nai B’rith, which was founded in 1908. Dave Matison became a leader of the regional B’nai B’rith. He eventually joined the board of the National Jewish Hospital in Denver, Colorado. He was able to use his influence to get a non-Jewish woman from Laurel with tuberculosis admitted to the facility free of charge. When the Denver hospital erected a new building in 1929, the Laurel Morning Call ran a front page story that highlighted Matison’s role in the organization, which was a source of pride for the entire Laurel community, both Jews and Gentiles. The Jewish community in Laurel peaked in the 1930s, and thereafter declined along with the fortunes of the town. An explosion of railroad tank cars in 1969 damaged the small synagogue, and the dwindling congregation decided it was futile to rebuild it. The building materials were donated to two black churches. The remaining Laurel Jews used their remaining funds to create the Knesseth Israel Charitable and Educational Trust Fund which donates money to 25 worthy causes. One of the Torahs found a place in the basement of the local art museum, and was available to view, but only if you already knew it was there. Currently, the Torah is on permanent loan to the Museum of the Southern Jewish Experience, it has been displayed and used for religious services. Today, the last vestige of Jewish life in Laurel is a vacant lot in the tony residential area where the synagogue once stood and a cemetery with an optimistic 130 vacant plots.